These Kit Kat Framboise were free samples from Tsunami.hk. I love trying different varieties of Japanese Kit Kats! 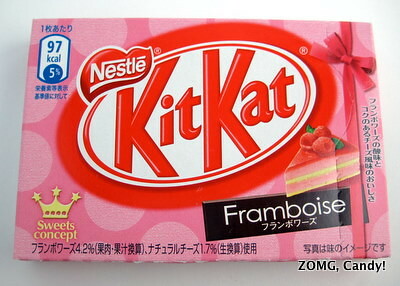 I’m also amused that these Japanese Kit Kats were named in French – framboise means raspberry. Everything about this Kit Kat was pretty. The pink polka dots and ribbon on the outer box made it look like a little present, and the inner wrappers were pleasantly retro with their pink polka dots and chocolate brown tips. The fingers themselves were pretty as well. The wrapper’s color combination of pink and chocolate brown was echoed in the actual chocolate: the creme filling between the wafers was pale pink. It smelled pretty artificial, but thankfully, that scent didn’t detract from the Kit Kat Frambroise’s taste. It had a strongly bright berry flavor with slightly seedy raspberry notes. The raspberry flavor packed enough of a punch to stand up to the creamy, dusky milk chocolate. 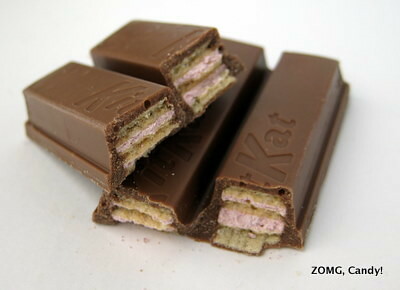 The wafers were crunchy and toasty and provided a nice contrast that highlighted the fruity chocolate. I loved this and wish it was available in the U.S. An OMG.